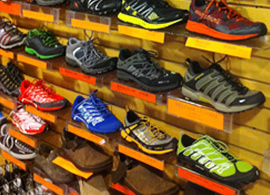 Ozark Outdoor Supply offers a wide selection of outdoor and lifestyle footwear. We carry hiking boots for the traditional backpacker to flip-flops for your kickback lifestyle in the summer. Our staff is trained to properly fit footwear and offer custom fitting options, such as moldable insoles. We have a large selection of socks for all of your activities from ultra-running to mountaineering. Whether your next trip is to the beach, trail, river, or the mountains, we have got the footwear for you.